10GB of beats, grooves, licks and chord patterns covering Pop, House, Disco, Soul, Funk, Rock, Latin and Jazz and with a massive dose of vintage feel. Whether you are a busy media composer, music producer or songwriter looking for some classy inspiration, The Resource is the resource you need. Review Amazona.de The Resource Die Klangqualität ist sehr hoch und die eingespielten Licks und Phrasen überaus abwechslungsreich und inspirierend. Review Keys The Resource The Resource stellt zu einem günstigen Preis das wunderbar breite Spektrum von vier Librarys zur Verfügung mit denen man nächtelang experimentieren kann. Review Musicians Life The Resource Die Library ist ausgesprochen umfangreich und insgesamt von sehr guter Audio- Qualität. The Resource; 10GB of beats, grooves, licks and chord patterns covering Pop, House, Disco, Soul, Funk, Rock, Latin and Jazz and with a massive dose of vintage feel. Whether you are a busy media composer, music producer or songwriter looking for some classy inspiration, The Resource is the resource you need. With over 2500 drum loops, a further 2300 percussions loops, a range of individual drum and percussion sounds, 2100 chord progressions created on fat and funky real instruments and nearly 5000 vintage-style licks and phrases featuring more than 20 different live instrument types from Fender Rhodes to the Flugelhorn, The Resource will keep you inspired and engaged. A mega-library of vintage musical magic at a bargain price and that’s ideal for exploiting the power of Elastik. 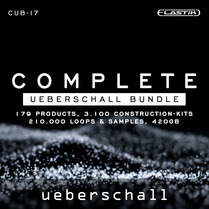 The Resource includes a huge drum section with 2500 Drum Loops, 2000 Percussion Loops and over 4500 Single Sounds. 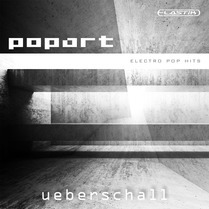 If you are in search for a certain style you will find it in this soundbank. 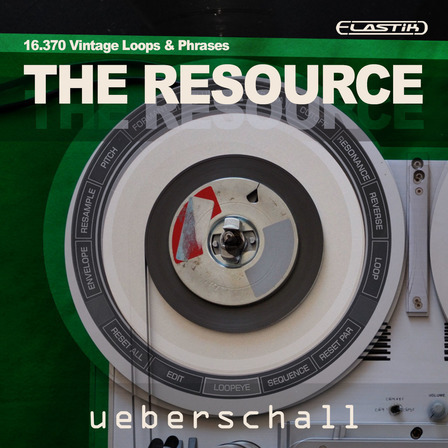 The Resource features a whole range of genres such as Funk, House, Soul, Disco, Pop, Rock, Beat, DnB, 2Step, BigBeat through Electro, Metal, Real Drums, Breakbeat, Analog Drums , Vinyl Loops up to Latin-, African- and World Percussion. 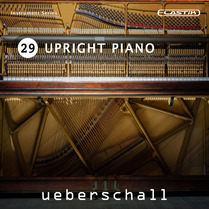 More than 2100 chord progressions, recorded live on real vintage instruments. No quantization, no Soft-Synths - everything is fat, real and funky! Each chord progression is presented in several rhythmic variations. 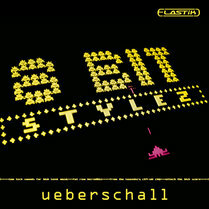 Stylistically, the bandwidth stretches from Pop, House, Disco, Soul, Funk, Rock up to Latin, Jazz and „Intro“-typical playing. Furthermore this library, indispensible to any studio, contains grooving Vintage Licks & Phrases for all styles in the Club, Pop & Dance scene. The licks were played on more than 20 different live instruments by professional studio musicians. 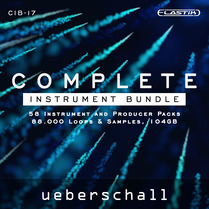 This soundbank comes with Ueberschall‘s Elastik. All names contain speed and root note information allowing for fast and easy navigation within a library. Time-stretching and pitch changes of loops can be performed easily and at highest quality using zplane‘s „élastique pro“ algorithm. 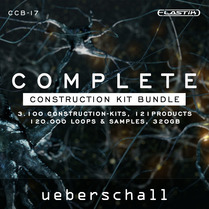 All instrument loops within a construction kit can be transposed with no effort. Also, all drums of a library can be exchanged and combined with each other. The attribute based browser with its clear layout enables access to all available loops with highest speed; across all installed Elastik libraries. With intuitive functions such as formant, resample, reverse and a multi mode filter, Elastik player allows fast music production but also offers free space to creatively manipulate loops.